At least five people were killed and three others injured when a massive section of a vaulted ceiling collapsed at a new passenger terminal at Paris' Charles de Gaulle airport, officials said. Slabs of concrete and metal came crashing down from the ceiling onto a seated waiting area at about 7 AM. 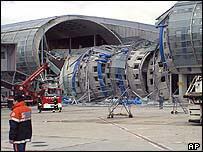 Part of the raised terminal structure then collapsed onto airport service vehicles underneath. The collapse left a hole 50 meters (yards) by 30 meters in the long, tunnel-like building. Officials said there was nothing to indicate a terrorist attack. De Mesnil said there was "absolutely nothing" in the past to indicate a structural problem. "It's the structure that gave way, the structure itself," he told reporters. A loud noise precipitated a crack in the terminal ceiling, and officials had been evacuating the area when the roof caved in.